The fashion industry is digitizing, enabling faster creation, production, distribution, and consumption, as well as design piracy, but the structures that exist to support and protect designers are yet to adapt to these developments. There is much debate about the rampant piracy within the sector and its impact upon fashion businesses. However, there is little academic research regarding piracy’s effect upon emerging fashion designers. 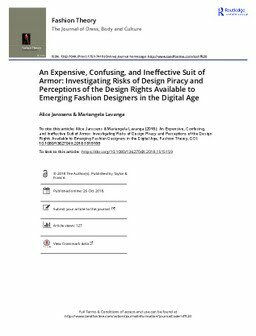 This study investigates: (1) the risk of piracy; (2) perceptions of the registered and unregistered design rights available to fashion designers, considering the case of UK-based emerging fashion designers; and (3) how the risk of piracy and design rights impact fashion designers’ strategies in online and offline environments. Employing qualitative analysis, we argue that significant ignorance and low usage levels render the design rights available to UK designers irrelevant. Furthermore, we suggest that emerging designers are hesitant to digitize their businesses due to concerns surrounding the protection of their products. This is reflected in the growing interest in sustainable textiles and local production, which may be employed to circumvent threats of piracy.